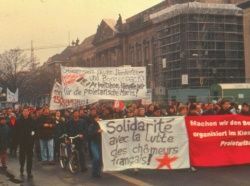 Kreuzberg was the Berlin district with the highest percentage of unemployed people and welfare recipients. WochenKlausur conceived a workstation, consisting of an “Info Tank” that would help unemployed people develop their own ideas of what they could do for a job, and a “Think Tank” that would aid them in realizing individual projects. Announcements were put in the newspapers, the employment office and other counselling institutions were contacted, public presentations on the issue were organised, and numerous experts from various fields were invited for talks. A great deal of cooperation was stimulated by these efforts: the district government made available an office in a good location, a “job creation program” contributed computers, and Frauke Hehl from the unemployment initiative Springboard took over the permanent administration of the workstation initiative. The final decisions were made at a summit meeting held on a boat excursion on the river Spree. To provide opportunities and advice for the unemployed. The Info Tank supplied information about existing opportunities in Turkish and German and offered individuals support in developing and formulating their own ideas and plans. In the summer of 1999, the Think Tank launched its first projects, drawing up exact plans for their realisation, testing their feasibility and contacting possible cooperation partners. 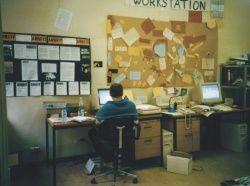 Today the workstation has a staff of more than twenty – some working on a volunteer basis – and is located in nearby Friedrichshain.